Lip Injection Extreme is a lip plumping serum that gives long term results based on four of the most scientifically proven and advanced lip plumping technologies(marine sponge, collagen booster, instant blood vessel dilators, botanical cocktail of avocado oil and jojoba). Increase lip volume and maintain plumpness with continued use! This serum is to be used in the morning and evening along with your normal skin care routine. Apply a generous amount of Lip Injection Extreme on clean dry lips. Wait one minute before applying lip color or balm to allow the unique formula to penetrate your lips. For maximum long term results, use for a minimum of 30 days - am and pm. It is indeed a very good lip plumper, but it did not give me long term results. Even though I carefully used it every single morning and evening for more than a month, the effect worn out after a day or even less. And for that price, I guess you could buy any lip plumper which gave you short term results. The moment it touches your lips the tingling begins. And it's not just ordinary tingling, it's the most annoying thing I've ever felt, but, as I am really desperate for getting my lips bigger bigger bigger, I just endured that sensation twice a day for over a month! After a few minutes my lips start to turn red, a really hot red, but I must tell you, my lips are quite pigmented so this may differ from person to person. The tingling disappears after a few minutes, the plumping effect after a few hours. But be careful! Never ever ever apply it over your natural lip line, it will hurt really bad! The main thing that made me choose this and not 4 is that they promise long-term effects and I haven't seen any. Too Faced Lip Injection Extreme este un glos tratament folosit pentru marirea buzelor pe termen lung. Acesta are la baza cele mai noi tehnologii in materie de marire a buzelor. Firma promite efecte de durata dupa o folosire intensiva, dimineata si seara, timp de 30 de zile. Desi l-am folosit cu strictete de 2 ori pe zi timp de mai mult de o luna, efectele pe termen lung promise de cei de la Too Faced au intarziat sa apara. 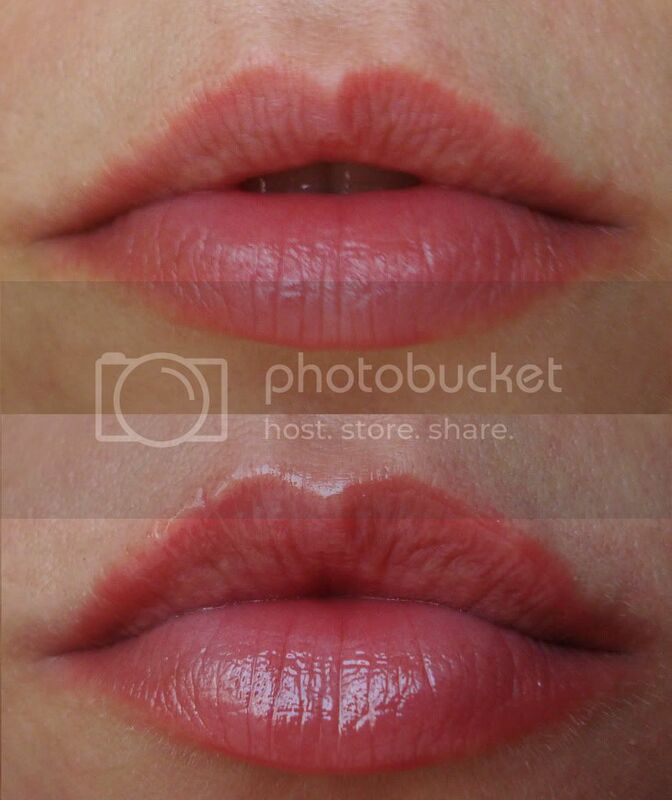 Intr-adevar este un lip plumper foarte bun, dar la pretul sau nu se merita si sunt sigura ca puteti gasi un gloss la fel de eficient si mai ieftin. Imediat ce il aplic simt intepaturi, pot spune ca sunt cele mai puternice pe care le-am simtit vreodata cu vreun produs din gama lui. Dupa cateva minute buzele incep sa se umfle si sa se inroseasca destul de mult, mai ales pe margini. Insa eu am buzele destul de pigmentate oricum, asa ca acest efect s-ar putea sa difere de la persoana la persoana. Aveti insa grija sa nu il aplicati peste linia naturala a buzei din exces de zel! Va puteti irita destul de rau. Mai sus gasiti fotografii cu produsul si "before & after". Am ales asa si nu 4 pentru ca nu este prezent efectul de lunga durata promis de firma producatoare. This is the most excited I've ever been to run out and purchase something. Only because of your results!! I hope it works so good for me. Thanks for sharing this. Lip injections are having a bit of a moment, as many people feel that plumping a pout with a liner won’t do. And therefore, lip injections are all the rage and don’t appear to be going anywhere soon. Very useful post. You can also check 10 quick tips about Lip Injections.